Climbed on February 28, 2008. How to get there: From Stanford University (or anywhere on the San Francisco Penisula), drive south on freeway 101 towards San Jose, continue until the 680/280 interchange and get onto freeway 680 heading north (sign for Sacramento). Take the exit that reads Alum Rock Avenue. Turn right on Alum Rock Avenue, go through several traffic lights as you head towards the hill. After approximately 2 miles (3.2 km) on Alum Rock Avenue, make a right onto Mount Hamilton Road. Measure from here. After 2.4 miles (3.9km), keep left as the road forks. After 13.2 miles (21.2km) stay right at a road fork. Continue to about mile 19 (30.6 km). You are now on top of Mount Hamilton, there are several telescopes up here. Drive carefully along the ridge, after leaving the buildings behind, you will see a small tower on top of a higher point in front of you. A small road closed by a gate forks left. There is a sign saying that the small turnout at this point is a no parking area. Continue downhill, while looking for parking at a turnout on your right side. First, you see a small turnout, then a (slightly) bigger one. Park here, this is a reasonable trailhead. The location is N37:20.752, W121:37.560, elevation 1234 meter. Route description: Hike a short way, back up the road. You have two alternatives. Either go all the way up to the gate and cross the fence there, then follow the small road that turns into a trail to the top. 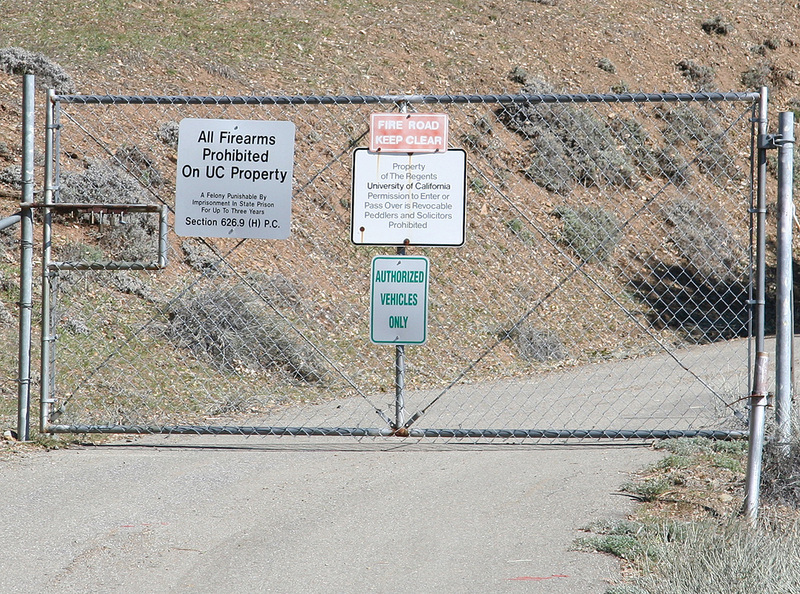 The gate has signs saying "no trespassing", so obviously, this is not a route that is officially welcomed. Alternatively, shortly after you pass the small turnout, find a suitable place to climb the somewhat steep right hand side (as you are walking uphill) of the road. The slope gets better higher up. Ascend this ridge, then follow the ridge left until you reach the small tower on the top of Copernicus Peak. There are a few places with dense brush, however, the going is never really difficult. There are no signs or fences blocking access along this route. Comments: My original plan was to visit Google this day, however, my contact there called me and told me that he was sick and had to stay home. Unfortunate, but there will be another opportunity. I decided to visit Copernicus Peak, the high point in Santa Clara county. I had a quick review of the information at summitpost before starting out from Palo Alto around noon. I proceeded to the gate and noticed that the very natural parking area there had signs saying no parking any time, obviously another measure to keep people out. 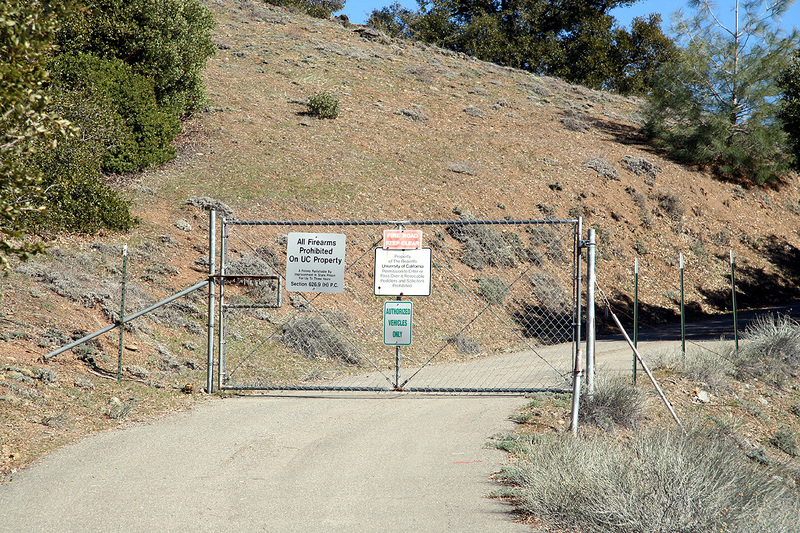 The gate had signs saying that this was the property of The University of California (who operates the Lick Observatory), thus contradicting the claim that this area was controlled by the Forest Service. The entire situation is yet another example of pretty stupid US laws trying to keep people from hiking perfectly reasonable areas. 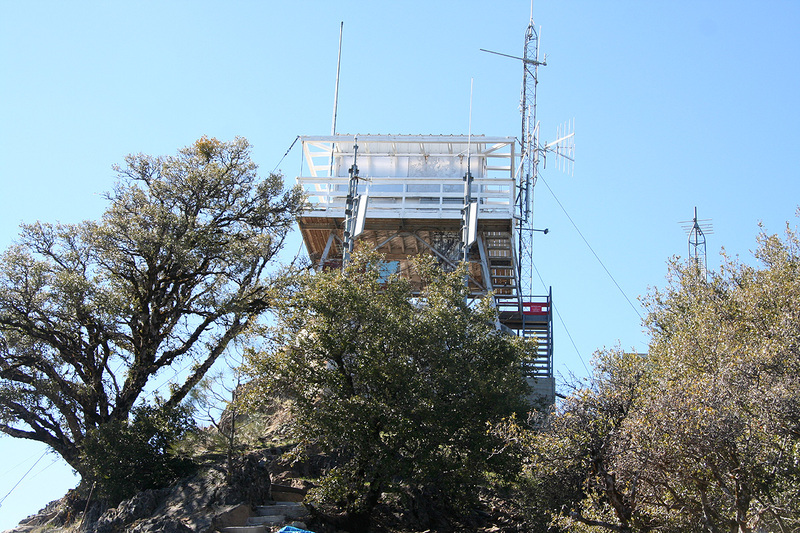 That some private people attempts this may perhaps be understood, but that the University of California or the Forest Service should have any interest in preventing hikers to visit the Santa Clara County highpoint is not easy to comprehend. Anyway, I continued driving slowly downhill and spotted a small turnout on my right hand side where parking was possible. From here, I started back up the hill, then found a place to scramble up the somewhat steep slope next to the road. The terrain was better higher up and I could soon follow the ridge uphill and directly to the small tower on top of Copernicus Peak. This route of access is pretty discret as it is out of view from the telescope area. Moreover, it crosses land without any sort of fence, there is not a single sign about trespassing either. Thus, one should not ask permission when climbing this peak. One may cross the fence next to the gate (through a hole), or follow my route which is a bit more difficult, but perhaps more fun. I reached the summit at 1340, perhaps 15 minutes after leaving my car. After looking around and taking the standard GPS reading as well as some pictures, I returned to my car around 1400, it is a very short hike indeed. Returning to the Bay Area, I first made a short stop at a trailhead that served a small hill giving a good view of Mount Hamilton, then proceeded to have a late Mexican lunch at a small place on Alum Rock Avenue. 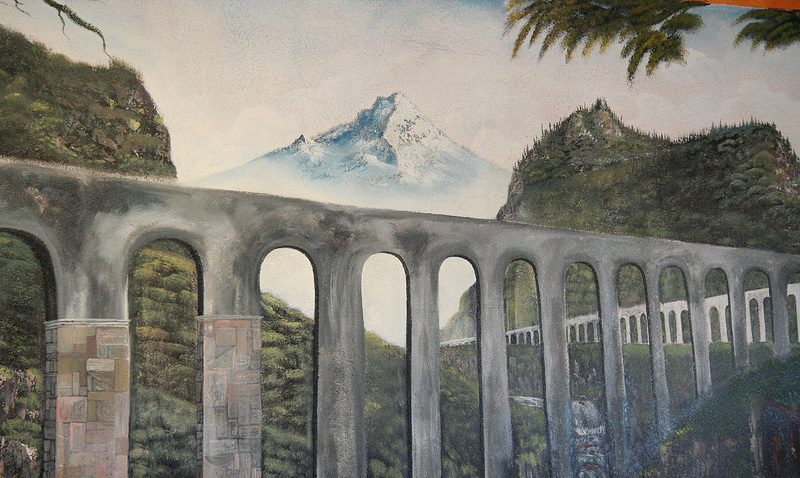 The restaurant had a nice painting on one wall. I asked the owner about it and he said this place was a few hours drive north of Mexico City. The mountain surely looked interesting. Mount Hamilton. 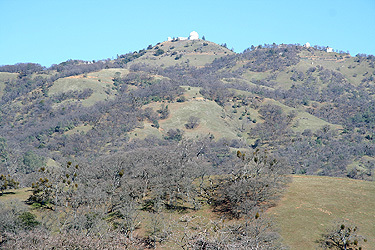 The white telescope domes are clearly visible. Copernicus Peak is the highest point on Mount Hamilton, it is a bit left and behind, out of view on this picture. Summit view zoom, towards the Sierras.